The cool new Fuego Element Portable Gas Grill is a convenient gas-powered grill that is compact enough to easily take along to the beach, a picnic, campsite, tailgating party, boat, construction site, balcony, patio, or just anywhere outdoors when a voracious hunger sets in. 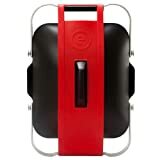 It produces up to 8,000 BTUs with a high-low temperature setting of 350 to 650 degrees F powered by liquid propane canisters and features an enamel-coated cast iron grill grate, powder-coated steel lid, anodized aluminum legs, an easy to clean grease management system, and a handle for carrying. Best of all, you don't even need to know how to make fire, just use the quick push start igniter. Check out the video demo below to see it in action.